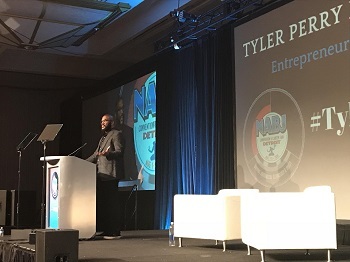 DETROIT, MI (AUGUST 3, 2018) -- One of the most popular sessions of the 2018 National Association of Black Journalists Convention and Career Fair, Tyler Perry’s master class on entrepreneurship and branding had many walking away with newfound confidence. After an introduction from actress Ptosha Storey, Perry started his session with a video thanking his fans for 25 years of success and loyalty. He then informed the audience that he had just returned from a spiritual vacation, so his delivery would sound much like a sermon. Perry delivered a compelling speech about work ethic and what it takes to succeed as a business owner. “If you’re going do something incredible, you’re going to need an emotional tolerance and high risk endurance,” he said. Perry talked about how his father would build houses for a living and not make nearly as much as the person selling the house. That experience would fuel the entrepreneur flame in Perry’s heart. The session ended with Martin rejoining the pair on stage with a story of how Perry took the time to call him and give encouraging words after his TV One show was cancelled. In parting, Perry said he hoped his words had planted a seed in the spirits of audience members.